Image of flag. Source is not given. 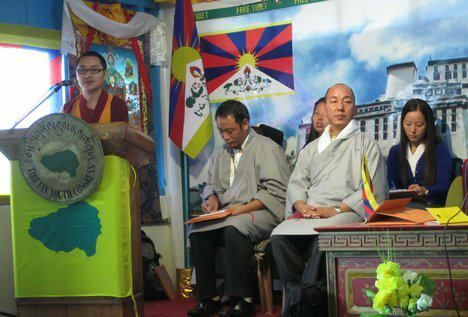 It's not clear to me which flag is being identified here - it could be the green flag with a blue map of Tibet on the front of the podium, or the Tibetan flag with the yellow stripe along the bottom, or the elaborate banner behind the speaker. Follow-up from previous message - a subsequent message shows only this flag, and in different lighting it is green on a yellow field. I think the said flag must be the yellow with green Greater Tibet map. The flags on the right wall and on the staff are just the usual Tibetan flags. And the banner on the background is a thangka, a religious painting. Concerning the green map, it shows the areas inhabitated by Tibetans, and which are therefore claimed by the Tibetan administration in exile. This cultural Tibet is bigger than both the actual Tibetan Autonomous Region and the former Dalai lama-ruled Tibetan territory. Some small territories in the East may have been lost to the Sichuan or Qinghai province, but for the most part these two areas were identical. The correct name is Tibetan Youth Congress.